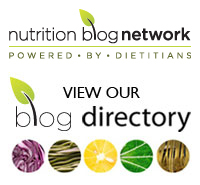 Back in March, for Nutrition Month, my friend Emma featured a series of interviews with dietitians and others on her blog. Something I noticed when reading these interviews struck me. When posed the question: “What’s your favourite food/drink that The Food Babe says you shouldn’t consume?” many people provided variations on the answer that they don’t pay any heed to what The Food Babe says. I know that there are many others out there. If you can think of others who you think should be on this list please feel free to add them in the comments! Tags: nutrition, quacks, The Food Babe, top 10 | Permalink.